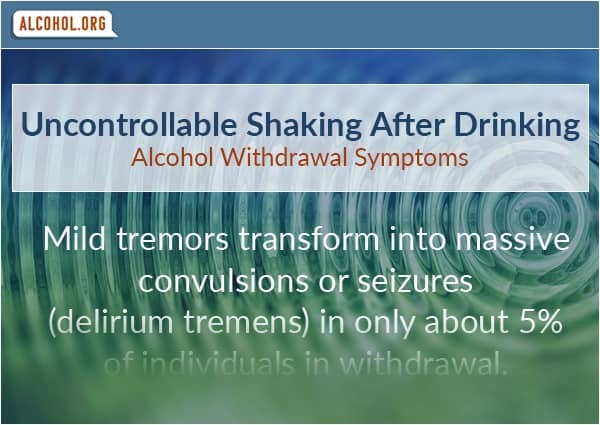 Alcohol shakes, also known as tremors, refer to an alcohol withdrawal symptom that manifests as rhythmic shaking in various areas of the body, particularly in the hands. It is a condition that reflects the effect of alcohol on the parts of the brain that control muscles. As one of many withdrawal symptoms that an individual may experience when battling an alcohol addiction, the development of the shakes can indicate that it is time to seek medical help to ensure a safe transition from dependency. Shakes and tremors typically occur in the hands but can occur in other body parts. Having anxiety issues during the withdrawal process can increase the severity of shaking. Mild tremors transform into massive convulsions or seizures (delirium tremens) in only about 5% of individuals in withdrawal. Trembling occurs when the brain gets accustom to lower levels of stimulation due to frequent alcohol consumption and when discontinued, it gets flooded with hyperactivity, resulting in shakes. The onset of withdrawal symptoms begin about 10 hours after the last drink, peak around 48 to 72 hours, and can last for up to a few weeks. Medications are available through detoxification programs that can help manage the pains of these symptoms. According to the National Institute of Health, more than 700,000 people receive alcoholism treatment per day in the United States. Some of these individuals surely started off believing they could beat their alcohol habit by quitting cold turkey. The truth of the matter is that alcohol addiction creates a serious physical dependency that is very hard for an individual to break alone. To complicate matters, it is impossible to know in advance how severe a person's withdrawal symptoms may be. The intensity of withdrawal differs from person to person and can relate to individual variables, such as how much a person drinks on a regular basis and how quickly a person stops drinking. Alcohol withdrawal shaking is only one of a list of possible withdrawal symptoms that an alcoholic may experience that includes anxiety, fatigue, depression, irritability, and nightmares. Many people experience relatively mild withdrawal symptoms that are difficult to deal with but not necessarily life-threatening. A percentage of people, however, progress from mild to severe symptoms that can presage a sudden health crisis. The onset of the shakes is a significant indication that a person's withdrawal symptoms are progressing to the point where medical intervention is advisable. The shakes from alcohol can change from mild tremors to massive convulsions. This extreme form of uncontrollable body movement is a symptom of a severe type of alcohol withdrawal called delirium tremens that can cause seizures and even death. Although delirium tremens manifests in only about 5 percent of the individuals in withdrawal, the onset of the shakes makes it more likely that an individual will progress to this level of withdrawal and need immediate medical attention. More frequent abuse of alcohol over a longer length of time makes it more likely that an individual will experience withdrawal when quitting, especially if the individual stops suddenly. Symptoms usually develop within 10 hours of a person's last drink and worsen over the next 48 to 72 hours, but that course is not set in stone. Alcohol withdrawal can last for days or weeks, and may be compounded by underlying medical conditions that can change how common symptoms present. Another factor to consider when battling alcohol withdrawal alone is the affect the physical symptoms may have on the other people in the area. The shakes, in particular, can be very troubling to people who do not understand the stages of withdrawal. They may mistake alcohol shakes for a sign of other types of drug abuse. Some may mistake the shakes for a sickness, generating a stigma that can persist long after the effects of alcohol withdrawal have subsided. To prevent the shakes and other withdrawal symptoms, it is important to consider a professional alcohol detoxification program that can help mitigate the physical effects of withdrawal. Detox programs are offered on an inpatient and outpatient basis, with many options to meet the needs of people seeking help. There is medication available that can stop the shakes and other symptoms, while a person's body adjusts to the lack of alcohol. After detox, an individual can choose a treatment option that will help teach the person how to manage alcohol cravings and live a sober life. The likelihood of long-term success battling alcohol addiction starts with properly managing the withdrawal process. A relapse in the alcohol withdrawal stage can cause severe medical problems and make it more difficult for a person to achieve sobriety in the future. Call our free referral service to get the help you or a loved one needs to deal with withdrawal symptoms like the alcohol shakes.